Check out these fine furry creatures! All these and more are available for adoption from C.A.R.E. 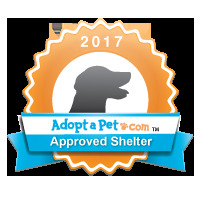 If you are interested in adopting, please read through our adoption info page for information about the adoption process and then fill out the Dog Adoption Survey. C.A.R.E. volunteers teach the dogs gracious, polite behavior so when they go out in the real world they will impress everyone they meet. Obedience methods learned from Wendy DeCarlo and Dennis Damon of Dog Obedience Group are used exclusively. We highly recommend that our dogs continue with Dog Obedience Group to ensure a seamless transition into their new home. The dogs also receive veterinary examinations and vaccinations. All medical records will be provided as part of the adoption process. 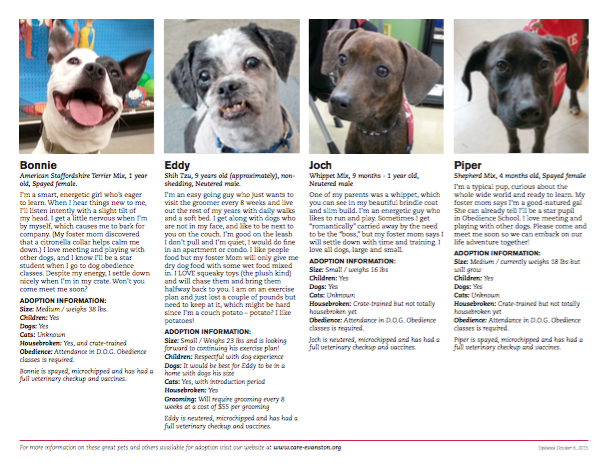 If you are interested in adopting, please carefully read through our adoption info page for information about the adoption process. The C.A.R.E. 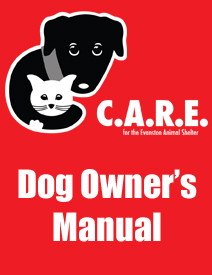 Dog Owner's Manual is a collection of the information that we hand out to new adopters. Included in this downloadable PDF is a number of informative articles gathered from numerous sources to help you with your new family member. Click on image to see more photos or to email or share on social media. If you have an older system and the images aren't loading below, click here to see our pets. These pups are in the process of meeting potential adopters and will be going home soon. These lucky pups are now in their furever homes!